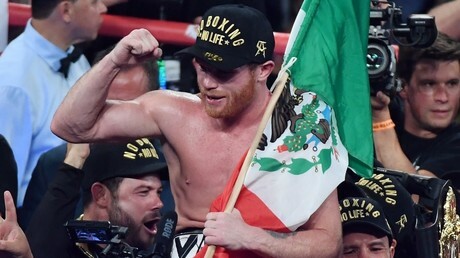 Mexican pound-for-pound star Saul “Canelo” Alvarez dropped defending champion Rocky Fielding four times in three rounds as he stopped the Brit to become a three-weight world champion at Madison Square Garden. Alvarez, 28, had already captured world titles at light-middleweight and middleweight. And he added the WBA regular super-middleweight title to his extensive belt collection with a dominant display in New York. Alvarez’s punch power was simply too much for Fielding to handle, as he got to work straight away in the opening round, dropping the defending champion with a thumping left hook to the ribs two minutes into the contest. Fielding beat the count and survived the round, but it was clear that the Liverpudlian wasn’t able to handle the Mexican’s heavy-handed punch power. Alvarez dropped Fielding with another big body shot at the end of the second round, then decked the Brit with a huge right hand over the top in the third. Once again, the gritty Englishman beat the count, but he was sent straight back to the canvas with another huge body shot from “Canelo” as the bout was waved off mid-way through the third round. In total, 45 of Alvarez’s 73 punches landed were to Fielding’s body, and the Mexican revealed after the bout that attacking the Brit’s midsection was the gameplan heading into the contest. “That was the plan in the gym, to hit the body, then move up, and you saw the results,” he said, before saying he wasn’t sure which division he’d compete in next. “I felt good, and I felt strong [at super-middleweight],” he said. “I didn’t have to dehydrate myself to make weight. “We’ll have to see. I’ll talk to my team, but without doubt [I want] the best fights. And when asked whether he’d be interested in another fight with middleweight rival Gennady Golovkin, Alvarez said he’d face the Kazakhstani star in a trilogy fight if the demand was there for a third contest.